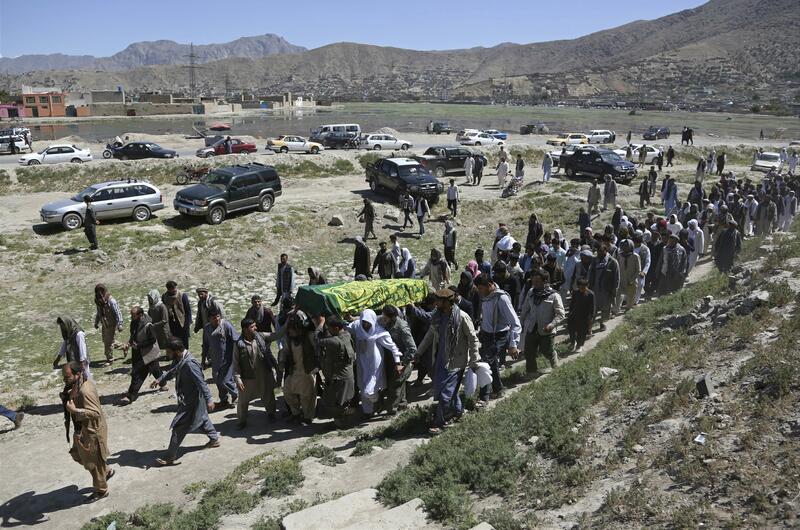 Thu., June 1, 2017, 8:07 a.m.
KABUL – Afghanistan joined in both anger and sorrow Thursday amid the aftermath in bomb-shattered Kabul, as mourners buried the dead and officials grappled with questions over how to confront a seemingly unstoppable insurgent threat. Wednesday’s truck bombing in the Afghan capital’s diplomatic zone – one of the city’s most highly guarded areas – claimed more than 80 lives, injured another 460 and decimated entire blocks in one of the bloodiest single attacks to hit Afghanistan in years. Afghan’s Taliban denied any links to the explosion, coming during the first week in the Islamic holy month of Ramadan. But Afghanistan faces violence from other militant factions, including a branch of the Islamic State. Crews worked to clear away building rubble and wrecked cars in a large area around the 15-foot-deep bomb crater, sealed off by hundreds of police. Victims’ families began holding funerals and mourning ceremonies in mosques across the city. Meanwhile, relatives of those with severe injuries – including extreme blast burns – hovered worriedly around their hospital beds. But the dominant mood of the capital was a mix of rage and recriminations. At informal gatherings, on social media and in several small but intense public rallies, people denounced the government of President Ashraf Ghani for failing to prevent the ongoing violence and said the country’s future seemed increasingly bleak. “Let us turn the silence of suffering into a national voice. We must all come together to stop terrorism from going any further and raise our voices against oppression,” a young man with a bullhorn exhorted protesters gathered Thursday at the perimeter of the blast site, surrounded by watchful riot police in flak jackets and helmets. There are 8,000 U.S. troops in Afghanistan supporting the government, but earlier this year, Gen. John Nicholson, the top U.S. commander there, said he needed several thousand more to break the stalemate. The U.S. Embassy is about a half-mile from the blast site, but at least nine Afghan guards died in the blast, the State Department said. Eleven U.S. contractors were injured. The Ghani government, weakened by internal tensions, has faced an uphill battle to fend off an aggressive push by Taliban insurgents in recent months, as well as a number of assaults claimed by the Islamic State. Published: June 1, 2017, 8:07 a.m.